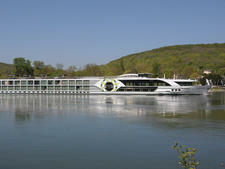 With so many similar itineraries and similarly sized ships, river cruise lines can all seem alike after a while. Tauck, however, stands out from the pack with its all-inclusive nature, casual elegance and sophisticated vibe; it's the Ritz Carlton of Europe's rivers. Grace came into service in 2016, the latest in Tauck's Inspiration class. The ship is gorgeous in an understated way, with graceful chandeliers, ironwork and marble floors in the lobby, molded ceilings in the main lounge and a color palette of grays, blues and tans that is beautiful without calling too much attention to itself. It's classy. One of Grace's key distinctions is that the ship only carries 130 passengers, despite being the same size as many of its competitors (who regularly carry 150 to 190 passengers). Having fewer people onboard really makes a difference. Shore excursions, happy hours and dinners seem more intimate, and you never have trouble finding a table. 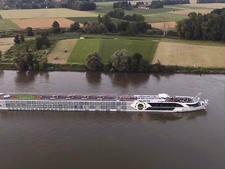 The ship also uses open seating for its main restaurant, which alleviates the "herding" problem that can take place on vessels where everyone eats at the same time. While it lowers the number of passengers, Tauck ups the number of staff. A cruise on Grace has one Tauck cruise director, along with three assistants, who act as combination den mothers and charming conversationalists. (These are actually the only Tauck employees onboard; ship operations are handled by the Swiss company Scylla, which actually owns the vessel.) We've noticed the Tauck directors replacing batteries on Vox headsets, chatting with solo travelers and handing out chocolates on return bus trips. Best of all: Your gratuities are included in your fare, so you don't have to worry about how much to tip everyone. Even the spa onboard includes the tip in the price (and that's about the only place where you'll need to use your credit card). The only disadvantage we noticed on our Grace cruise is that the line doesn't seem to go out of its way to make accommodations for passengers who might have mobility issues -- a bit surprising, given the demographic. Grace does have an elevator that goes between decks (and it's pretty, too, with a design that blends into the lobby), but it doesn't go all the way to the Sun Deck -- a problem when passengers have to pass through other ships to disembark. Twice we noticed groups of passengers struggling to return to the ship, once due to distance and another due to darkness. At the luxury price point that Tauck commands, it seems more troubleshooting by the ship staff -- golf carts? flashlights? -- would have gone a long way. The line warns customers in its brochures to expect a lot of activity; take this seriously if you have trouble getting around. There is a group for less active travelers for every walking tour. Still, we found this the only flaw in Tauck's well-oiled machine. 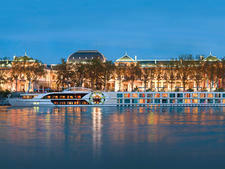 Grace is a great choice for affluent cruisers who wish to tour Europe's rivers without too much hassle; the line even gives you spending money for lunch ashore. 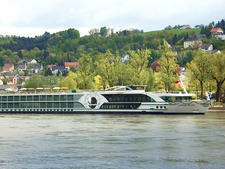 Local wines and dishes onboard, as well as signature Tauck events in port, such as dinner at a one Michelin-star castle-restaurant near Rudesheim, give you the flavor of the region, while still keeping you within the comfortable structure of a tour. It's this consistency that brings travelers back to the company again and again. Tauck attracts affluent passengers who are well-acquainted with group travel; many have been on one or more of the company's land tours. The age of passengers ranges from 60s to 75, with the average being about 70; there's a smattering of people in their 50s as well as those who are older, but this is not the norm. Most of the passengers are American, although you'll also find people from other English-speaking countries such as the U.K. and Australia. Several times during the year, Grace is used for Tauck Bridges, a program developed for families. 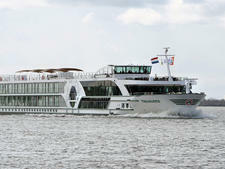 On these cruises, the age range skews younger, with many families traveling in a multigenerational group. 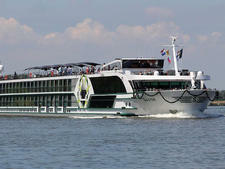 Cruise Critic’s professional photographers and our extraordinary community members have taken 518 pictures of ms Grace. When you visit our photo galleries, you can be assured that what you see is what you get. 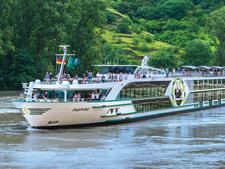 Tauck seems a little dressier than other river cruise lines, due primarily to the number of events and special dinners; at least one Welcome Dinner and one Gala Evening are held onboard, plus the aforementioned meal off the ship. Men will want to bring a jacket and tie for these, while women can get by with a dress or elegant top with black pants. No heels are needed, and indeed, good walking shoes are a must. Most days on the ship and for shore excursions, a casual wardrobe of T-shirts, shorts, capris and tops is just fine. For dinner in the main dining room, the line asks people to dress "resort casual," which means collared shirts and slacks for men, and a nice top and skirt and pants for women. The line prefers that shorts, T-shirts, jeans, sneakers, flip-flops and sandals are not worn to dinner (although we saw plenty of people wearing nice sandals and they looked just fine). There's no dress code for Arthur's, the ship's casual restaurant. Your fare on Grace includes all excursions, airport transfers, gratuities (including those for spa and salon staff) and unlimited complimentary beverages aboard the ship, including regional wine, beer, premium spirits, specialty coffee, water and soft drinks. 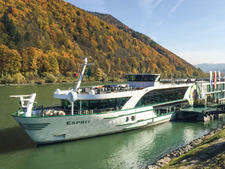 Another feature of Tauck's all-inclusive policy is that you don't have to worry about meals during the day; the line gives you 20 euros per passenger (or francs in Switzerland) for port visits that fall over lunchtime. We found this a great way to get passengers who might otherwise be disinclined to eat off the ship to discover local food and wine. The line also features unadvertised lagniappe moments; lagniappe is a French term meaning "something extra." On our cruise, this translated into a cocktail reception and snacks at the famed Baden-Baden Casino.